Fre d Koch paused in front of hospital room 3209 when he noticed a patient he had discharged moments earlier passing by on his way home. Koch, holding an IV bag in one hand, reached out with his other to shake the patient’s hand. “You take care, sir,” Koch said. Koch continued into the room with Shauna Star, who is in charge of Koch’s four-month initiation training before Koch can care for patients by himself at Christus St. Vincent Regional Medical Center. The registered nurses worked together to increase the patient’s dose of pain medication through the IV. They were on the third floor of the hospital in unit 3200, which is considered a “step-down” unit, meaning patients are usually stabilized and on their way home. 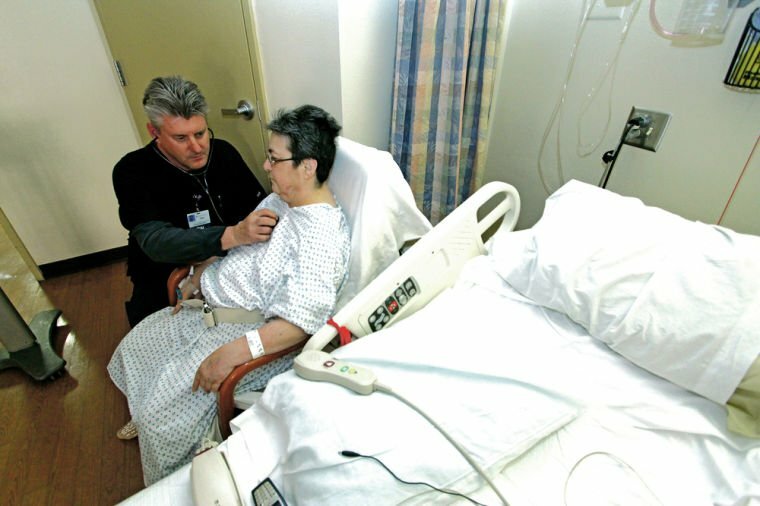 The unit is where patients are prepped for surgery, while others there are recovering. Some won’t recover, and the nurses make sure they are comfortable in their final stages of life. Koch doesn’t shy away from big responsibility. At 48, the high school graduate who worked as an artist returned to school to pursue nursing while working full time as a medical technician and caring for his two sons, then 4 and 7. He quit his 20-year job as a goldsmith because he said the travel required to promote his high-end jewelry took him away from his children too much when his 12-year marriage ended. His decision to switch careers was also about securing a future during uncertain economic times for himself and his two sons — Charle, now 10 and in fifth grade at El Dorado Community School, and 12-year-old William, a seventh-grader at the Academy for Technology and the Classics. However, investing in school might not have been possible for Koch without the financial support he received from his employer, Christus St. Vincent Regional Medical Center. Koch is one of 500 part-time and full-time nurses Christus St. Vincent employs. In March, the hospital held a ceremony honoring Koch and 11 other employees who received scholarships to support their nursing education. The medical center and St. Vincent Hospital Foundation reimburses hospital employees for tuition and living expenses, as well as awards scholarships specifically for nursing students. The hospital spent $120,000 on scholarships this year, according to hospital spokeswoman Mandi Kane. Scholarships provide each recipient with $13,500 a year, for up to two years, to cover tuition and a $1,000 monthly stipend for up to 10 months per year for two years. In addition, employees pursuing higher education are eligible for reimbursement of up to $1,500. Generally, employees who receive scholarships are those who work in entry-level positions and are from Northern New Mexico, said Julia Vasquez, manager of organizational development at the medical center. She said the hospital usually awards 10 scholarships a year. It’s hard to find scholarships that support nursing students in Santa Fe, according to Jenny Landen, director of nursing education at Santa Fe Community College. She said about half of her students have financial aid or loans, but the ones with scholarships typically are Christus employees. She encourages nursing students not to work because the full-time program is rigorous and demanding. “The reality is most of my students have to work,” she said. “A lot of them are supporting spouses and have children. Some are single parents. In this day and age, it’s rare to have a young, single student who doesn’t have financial obligations. What I see happening a lot is they end up having to work more than they should, and it’s a stress on their personal life, and I see it in how they perform academically. They get sick, fall asleep in class and struggle to keep up with their studies. “It causes a great strain on their education while they are here,” she said. Landen is working on how to increase nursing enrollment through part-time options with evening and weekend classes. Offering part-time options could also help grow the number of nurses in the state. 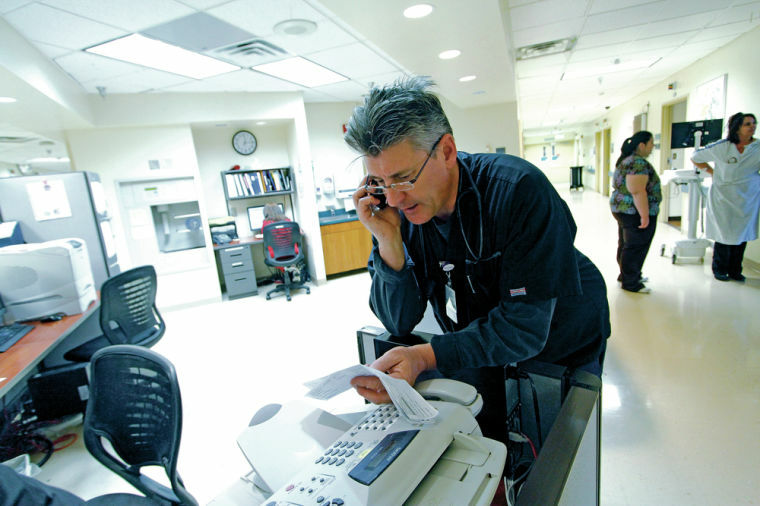 Increasing the number of nurses has become a critical issue as New Mexico, along with the rest of the country, grapples with nursing shortages. National health and nursing organizations forecast rising shortages due to population growth and retiring nurses. At the same time, nursing is the top occupation in terms of job growth through 2020, according to employment projections released by the U.S. Bureau of Labor Statistics in February 2012. Hospitals are trying to address nursing shortages with educational strategies such as offering scholarships to workers, according to a 2006 article, “Hospitals’ Responses to Nurse Staffing Shortages,” in Health Affairs. Authors reported that 97 percent of surveyed hospitals were using such strategies. The article called for more public financing to expand nursing schools. National efforts to address nursing shortages focus on educating more nurses, but many educational institutions can’t keep up with the demand. Santa Fe Community College receives twice as many applicants as it has spots, Landen said. When the college receives legislative money for the nursing program, Landen said she needs to spend it on her small faculty. While Landen is trying to expand educational options, she is also considering how to better support students. She said she may apply for a grant from the New Mexico Board of Nursing’s Nursing Excellence Fund to offer scholarships to students. Koch talked about his time as a student a week after he received his RN license. He sat at his long dining room table, where he did homework with his sons, in the home he bought two years ago. He lives in one of the new, south-side neighborhoods that border Dinosaur Trail. His humble demeanor turns prideful when he talks about his sons and how they have separate bedrooms for the first time since his divorce. Even with the scholarship money, Koch said he might not have attempted the nursing program if he knew how hard it would be to juggle children, work and school. As a native of Ontario, Canada, his credits didn’t transfer, so he had to complete two years of prerequisites before starting his nursing education at Santa Fe Community College. He took classes year-round, worked weekends for four years and managed three 12-hour shifts a week. He remembers late study sessions and bleary-eyed mornings when he would wrap his sons in blankets and drive the sleeping boys in the dark to a friend’s house. They would sleep on the friend’s couch while Koch started clinical rounds at the hospital, seven hours after he had finished his last shift. Koch is among the first new nurses to start work in the hospital’s float pool, which involves getting assigned to any unit that needs help that day. He finds out where to go 15 minutes before his 7 a.m. shift starts. For a former volunteer firefighter and a man who thrives on challenges, Koch appreciates learning everything he can to be an effective nurse. The first in his family to have a college degree, Koch expects that nurses will be required to have bachelor’s degrees at some point. He is planning to start classes this fall to achieve his bachelor’s degree in science. “No matter where you are in life, you can succeed,” he said.